Eltronicschool. - This is one pair of radio frequency transmitter and receiver remote controller with 4 channel application circuit schematic. In this circuit schematic the main component used are PT2262 Encoder and PT2272 Decoder like in Figure 1. as transmitter and Figure 2. as receiver. These are Circuit Schematic 4 Channels RF Remote Controller using PT2262 Encoder and PT2272 Decoder for you. 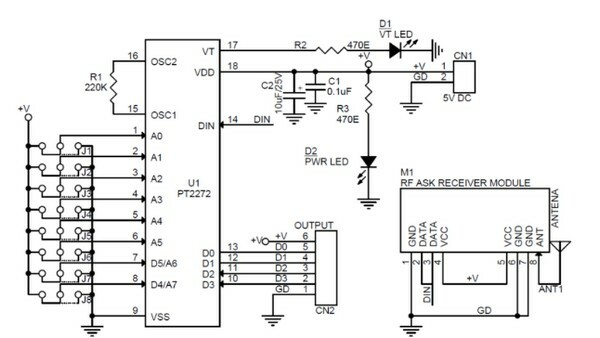 Using this circuit you can implement many electronic project application like Car Security System, Garage Door Controller, Remote Control Fan, Home Security, Automation System, Remote Toys, Robots, and Remote Control for Industrial. According electronic-lab site describe that 4 Channel RF remote built using PT2262 and PT2272-M4 IC from Princeton technology. PT2262 used as Encoder (Transmitter) and PT2272-M4 Decoder (Receiver) ICs are heart of the project. The receiver provides 4 channel Momentary outputs. All outputs are TTL level can be interface with other circuits or relay board. Transmitter works with 5V to 12V DC. Receiver works with 5V DC. When any of SW1-SW4 (S1-S4) tact switch is pressed the, power is applied to encoder IC and RF transmitter module, the encoder then starts scanning Jumper J1-J8 and transmitting the status of the 8 bits address and data serially. The decoder IC receives the data and compares two times with J1-J8 address jumpers and provides outputs high and also VT LED goes On, if the data is Valid and address of Transmitter and Receiver are same. It is important to have same jumper settings J1-J8 at transmitter and receiver to pair both. Multiple remote can be used to control devices at same location by changing the address codes. All address is Tri-State and offers 6561 combinations. 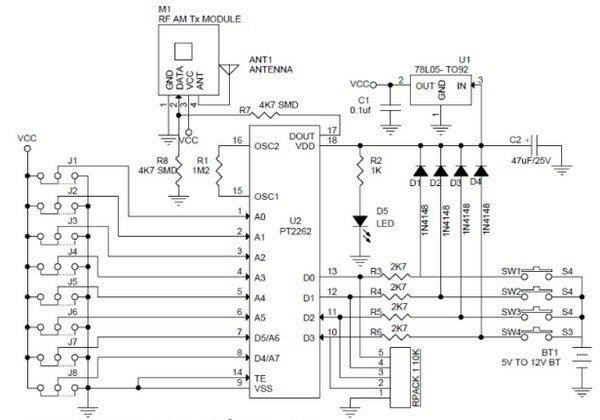 Now you can read more the article with the title Circuit Schematic 4 Channels RF Remote Controller using PT2262 Encoder and PT2272 Decoder using link here.